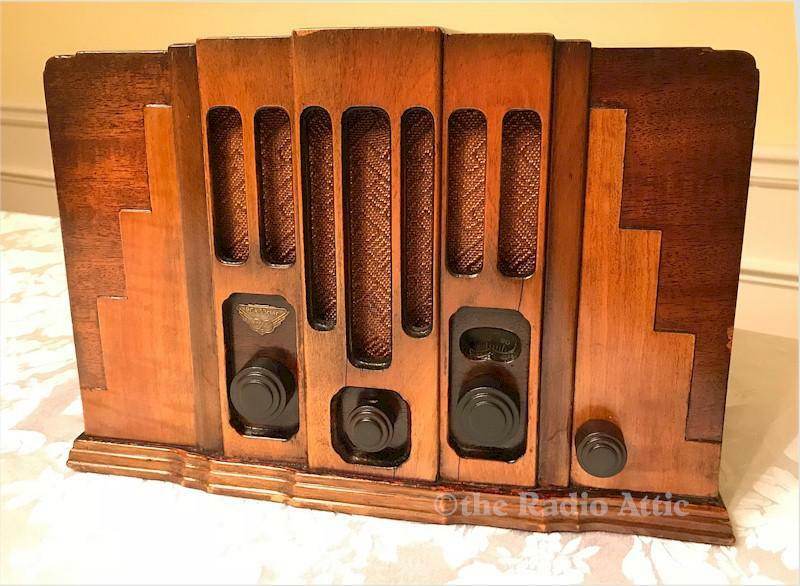 This RCA's "skyscraper" style cabinet screams Art Deco as much as any radio I�ve seen before, what with the contrasting veneers and stepped top. Yowza! This one has been in my personal collection nearly 30 years. The finish, to me, looks original and I couldn't bring myself to refinish it, as it looks too good, so I cleaned up and polished it. There is some wear, but I think it is gorgeous looking. This set is very hard to come by and prized by collectors. The electronics have been completely restored (no shortcut repairs and it is internally fused for your safety), and it plays very nicely on the AM broadcast band and also has the old Police band. 13-1/2"W x 9-1/8"H x 8"D.